I’m coming out of the organic closet. Since starting my blog, I have tried to remain fairly neutral on the subject of organic food. I mention my preference for organic produce here and there, but I’ve never felt like I should force my views on others. After all, organic food can be pricey. It’s not always easily accessible in certain parts of the country/world and many can’t afford it. There is no judgement here… we are all doing our best based on our individual budgets and situations. I encourage my readers (through my recipes) to eat unprocessed, cook from scratch and enjoy a balance of healthy foods. But when it comes to organics, I’ve never taken a firm position. Today, in the spirit of full disclosure, I feel it’s time to come clean. I admit it. My name is Tori, and I’m an organic food junkie. I grew up around agriculture. My father was an agri-business professor (now retired) at Cal Poly San Luis Obispo, one of the top ag schools in the country. I accompanied him to farm equipment shows and ranch tours. He grew up on a 1,000-acre cattle ranch in the Sierra Nevada mountains of Northern California. On my mom’s side my great uncle is also a cattle rancher. 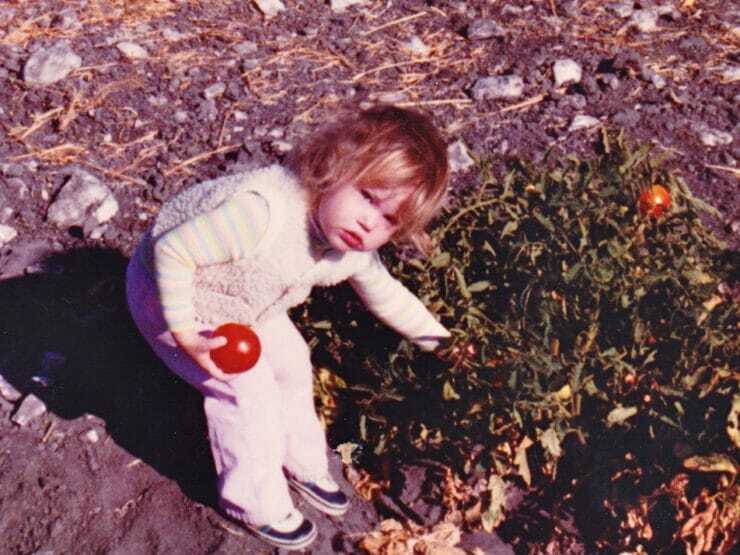 I grew up in California, where about 80% of our country’s produce is cultivated. My grandparents had a large garden at their home, which I helped them tend as a child. Needless to say, I learned a lot about farming produce and animal husbandry in my youth. Feeding the world’s growing population is a daunting task. Modern farming methods, including the use of pesticides and antibiotics, have allowed us to produce vegetables, fruit and meat on a massive scale, making affordable food available to all. But at what cost? I lost my maternal grandmother to cancer a few years ago. It was a tough blow for our family; she was in her 70’s, young and full of energy, one of the most vital people I’ve known. The cancer came “out of nowhere”– no family history and she was not a smoker. It caused me to pause, take a step back and look at our daily habits… what we eat, what cosmetics and cleansers we use, how we clean our house, the air fresheners we use. When I began tallying up the amount of chemicals we’re exposed to on a daily basis, it was truly mind-boggling. Everywhere I looked, there was another chemical. Most of these compounds have come into existence in the last 50 years or so, which means we can’t really anticipate their long term effects. In our foods, there were pesticides and preservatives and artificial flavorings and food dyes. In our dairy and meat, there were antibiotics and hormones. So many unnatural elements… how can they help but have an effect on us? I began the slow process of weeding out unnecessary products and finding more natural alternatives. It wasn’t easy, and it wasn’t always cheap, but it was an investment worth making for me and my family. I can’t draw an exact line between my grandmother’s illness and our daily chemical load, but it does give me some peace of mind to know that we are living a cleaner, more natural life. I wouldn’t say I’m obsessed. If there is a cheese I love, and it doesn’t come in an organic version, I will still enjoy that cheese every once in a while. It’s impossible to get rid of chemicals entirely, they are literally everywhere… but I’m working hard to limit our exposure as much as possible. When it comes to food, it’s becoming easier to find organic alternatives. Major grocery chains are carrying organic food lines now. Most cities and towns have farmer’s markets, where you can find affordable organic produce and meat. The more we vote with our dollars, the more we’ll encourage organic options. At the end of the day, we are all making the best decisions we can for our families based on the resources available to us. I would never judge another person for what is in their shopping cart. I share my own experience here in the hopes that you might connect to it; perhaps it might even inspire you to work more organics into your life. I’ve even started doing things the old fashioned way, such as using natural homemade cleansers made from vinegar and lemon juice (if you’re interested in making these types of cleansers yourself, let me know and I’ll share them here!). I believe that the more we can return to unprocessed, natural food options… the foods our great-grandparents cultivated and enjoyed, without antibiotics or pesticides… the more our nation’s health will improve. How do you feel about organics? Are they a vital part of your diet, or an unnecessary expense? Is it the wave of the future, or is it all just overpriced nonsense? I’d love to hear your thoughts. I was a chemistry major in college; and I taught chemistry and physics in both college an high school for 30+ years. One thing I know is that synthetic chemicals are, for the most part, not conducive to long term health. I avoid them as much as possible. Even drug prescriptions have side effects. We accept these negative effects because of necessity. So, for the last twenty five years or so, like you, I’ve tried to eliminate these chemicals as much as possible for both me and my wife. I do all of the cooking and most of the ingredients I use are organic. I also will make many food I items which are not commercially available and I bake our pies, cakes etc with 100% organic ingredients, usually with about one half or less the amount of sugar commonly used in these confections. My Italian wife has learned to love all the Jewish dishes i prepare the way my European born mom did. Her favorites are לאָקשנ kugel (except for the raisins savory, not sweet), stuffed cabbage, and kasha varnishkes. She is not all too keen on cholent and kishka. I’ve had to use non organic casings and farfel. but the other ingredients are organic. I only use meat about (organic grass fed) once a month so I have developed vegetarian versions of some foods where possible. However, I do plan on using the West African brisket in the near future. Fantastic. I continue working to reduce my family’s exposure to unnecessary chemicals, and have changed all of our bath/cosmetic products to cleaner alternatives as well. Hi Tori – I think organic is definitely not nonsense. Especially when you factor GMOs into the equation. Who wants chemicals and pesticides woven into the DNA of the food they eat? Gross! Talk about cancer causing. Great comments and topic Tori. I’ve been a “natural foods” kind of gal since joining my first food cooperative in the ’70’s…so I have always favored making things from “scratch” and using the freshest, seasonal and yes, organic foods. I have always paid more for some of these foods but feel better knowing that they are not processed or have harmful ingredients. I garden organically as well. When you have the harmful giant Monsanto producing huge amounts of GMO foods, controlling farmers,having government backing, and watching them strike down States legislation for GMO packaging, it is truly sad. While you’re at it with the theme, you should also address the huge modification of WHEAT. It is not the grain of our ancestors with all the engineering that has gone into its farming. Watch videos or read Dr. Wm. Davis’s “Wheat Belly” for some alarming facts and find out how he equates it with heroin for it’s addictive qualities. Since I cut it out my health has improved radically and I’m not a celiac. He makes quite a case and his work is highly worth the read or watch! Thanks. Yes, I am totally into anything organic or natural. I do like you do and try to eliminate as much as possible and pick products that are a better solution. I am growing my own fruit trees and expanding my veggie garden to help with the rising costs. It’s wonderful to go and pick fresh from your own yard or walk through and just pop a berry, fig or whatever in your mouth and know it’s probably the best thing you’ll eat all day. Totally natural and life giving. I have been eating partially organic for many years. Started with apples. Then I moved out of the city, to the country all around the farmers and became a locavore! The prices are sometimes outrageous, but for the dirty 15, I must. When I found out about potatoes – I don’t think I can eat a regular one again without gagging. I also heard about the water in CA and how it’s treated so I also won’t buy any greens from California. I am replacing anything I am out of, with more natural/organic skin/beauty products as I can. I would LOVE, since you are a trusted source, if you could have a section on that. Now, I am looking for a new perfume/scent and I am shopping online blind. Cosmetics aren’t regulated, so it’s a tough pick. I have always used soaps from farms. As for meats, I was buying directly from a grass fed/finished farm, but the prices on meats/chicken are astronomical. I am able to get it from a specialty market for less, probably not grass finished. I buy my eggs from someone who does it on the side, but the organic farmers charge $6 per doz. which is ridiculous. Tori, can you start a little section on better natural cosmetics and makeup? Working on that Elle, I definitely want to get into this kind of thing in more depth. Although, I do enjoy organic, I much rather support my local farmers over purchasing organic from a large chain. In addition to looking at whether or not food is organic, I find myself equally or more concerned about additives and chemical including what is in things labeled organic…xantham gum, guar gum, carrageenan, soy lecithin…we try to be practical depending on costs and how beloved an item is…but it’s a lot of work. Hopefully worth it, but I wish I had time to be more vigilant or make more things from scratch. Simple examples are things like almond milk and soy milk – read the packages carefully! This was an interesting topic. I think organic is great if you can find it and it’s not too expensive. If it is very expensive, such as the tiny package of organic blueberries I recently saw for $9.99, it’s probably best to do without. If we spend too much money on food for ourselves and our families, that means less money to have to give to the poor or buy food for one’s local food pantry. Shopping for foods in season can make a difference in price for all produce, and especially when it comes to organic. Another wonderful option is buying produce at the farmer’s market or from a local farm. Local farmers generally use considerably less pesticides than large commercial farms. They may even be “organic”, in a sense, but just can’t pay for the certification. And another wonderful option is growing a kitchen garden. Growing vegetables from seed does not cost very much and it’s usually easy to do. Local extension offices can usually make great suggestions for what vegetables do best in a specific area. And growing herbs is basically foolproof. The nice thing about having one’s own garden is that it’s basically organic. When it comes to make-up, creams, lotions and such. It’s best to wear very little make-up – maybe a bit of mascara and gloss but best not to use pancake make-up on the face. Instead, use homemade creams, etc. There are many recipes available on the internet and there are usually only a few ingredients involved. Sorry about your grandma, but when you are in your 70’s you are not young, luke expectancy is below 80 for woman! Also, you cannot asume tht because you buy sproduce in the frmer’s market, it is organic, they might be using pesticides or chemical fertilizers, and might not tell you that. Organic foods are fine. They aren’t always better than conventional produce on all points. [edited] There is evidence that organic farms produce as much or more pollution than conventional farms and that organic products might contain more toxins than other foods. Like all farms, organic farms rely on fertilizer. They often use animal manure rather than chemicals derived from petroleum or minerals. In one study of greenhouses in Israel, the use of manure led to much more nitrogen leaching into groundwater compared with use of conventional fertilizers. Nitrogen contamination is one of the main reasons for closing wells. Nitrogen from all sorts of farming is one of the main pollutants causing algae blooms, fish kills, and dead zones in water from local farm ponds to the northern Gulf of Mexico. Some organic production concentrates manure and leads to higher levels of toxins. One study in Belgium found that organically cultivated winter wheat had higher levels of lead and cadmium than conventionally grown wheat. The levels were below tolerable limits, and further processing could have removed some of the contaminants. I’m trying to buy as much organic or local as I can afford. I also encourage everyone to have a “greener” household, by using more natural cleaning products (btw, they clean great! ), not using plastic containers, disposable unnecessary paper goods. It actually saves money and feels much better! I agree with a previous comment that the best organic produce is that which you grow in your own garden. Hi Tori, NU? It’s interesting that your Baby Boomer Readers will recognize, as you have, that the food we grew up with was sans chemicals, antibitoics and monsanto – AKA Natural, Organic food grown in Healthy Soils that were rotated and naturally fertilized. I grew up in NJ and SoCal, both Agrarian states. I know reside in Austin Tx and what do you know! Texas is an Agrarian state too. For all those who want to eat HEALTHY why not choose LOCAL fresh foods. You can look for a LOCAL CSA or farmers market at http://LocalHarvest.Org They list all the (organic) farmers market throughout the USA. When you eat LOCALLY GROWN foods they are free from radiation and have not spent days/weeks in some warehouse and a re full of old time good nutrients because the food is LIVE and wholesome. Pam, so sorry that you were near Twin Towers during that horrific time. YES, all the pollution and chemicals surely have been ingested not only through your lungs, BUT YOUR SKIN which is the largest living organ in/on our body. Everything that touches the skin or lands on it gets pulled through into our blood stream and then circulates through our organs. My dad owned Store #1 Rexall Drug Store back in the 1940’s in Newark NJ when virtually all meds were made from herbs//minerals, essential oils, etc. BIG PHARMA is one of the biggest culprits with their Toxic Meds that might help a single ailment if it doesn’t kill you first, or your kidneys, liver, eyesight, cause cancer, etc. Big Pharma today is not about healing; it is about Big $$. Do NOT confuse big pharma with vitamins, minerals and natural remedies which have been around for thousands of years since the Cavemen or Garden of Eden Days. An example of Big Pharma and Doctors being resigned to using these toxic meds are your unfortunate ailments, for which I send my condolences. I have 40 yrs experience in natural remedies. If you would like to chat or learn more, please friend me on FB rs.malloyr.5 or click on my name here and send me a message through that website. Organic is a nice idea, but how do you know that the head of lettuce you just bought is truly organic? The sign says so? Please, there is no truth in advertising. The best I can do is make sure my produce is at least grown in the United States, and I grow a garden every summer. Along with my fruit trees and berry vines I don’t have to buy much at the supermarket. Sounds like you enjoy gardening and farming for your family and that is marvelous. Our ancestors grew their own foods to feed their families too. Buying LOCAL is much better than from across the country where the food could be on the road in containers for weeks on end or even warehoused. I appreciate our ability to grow your fruit trees and berry vines. I used to have huckleberry vines and grew 500 sq garden myself too. NOW I eat local Texas crops~ potatoes, lettuce, greens, onions, canteloupes, berries, cheeses, peaches, meats, fish and more and even as I remember eating corn picked from a NJ field that was sweet (raw) and peaches, I can almost taste the nature in the above mentioned LOCAL crops too. Congratulations! [edited] About 99.9% of the chemicals humans eat are natural. The amount of synthetic pesticide residues are insignificant compared to the natural pesticides produced by the plants. 99.99% of dietary pesticides are natural. Plants produce these chemicals to defend themselves against fungi, insects, and other animal predators. Average Americans eat 5,000 to 10,000 natural pesticides and their breakdown products. Each eats 1,500 mg (1/3 teaspoon) of natural pesticides each day, about 10,000 times more than the 0.09 mg of synthetic pesticide residues. Natural pesticides make up 99.99% of the pesticides in our diet, and synthetic pesticides are the remaining .01%. These pesticides are equally likely to be cancer-causing, but it does not follow that they are causing human cancer. Dr. Bruce Ames and Dr. Lois Swirsky Gold believe most of these natural or synthetic pesticides don’t present problems because the exposures are very low compared to the high doses given to rodents in lab tests. Not nonsense! America is far behind other countries, where gmo’s are illegal. Organic is essential. I used to be obsessed with organic-only until I read some actual peer-reviewed material on the subject and realised what a racket it generally is. Same with GMOs.